A year ago, towards the end of the Super Bowl Netflix announced the surprise premiere of the third installment in what has become an anthology of weird tales with The Cloverfield Paradox. Now Blu-ray Disc collector’s can add the film to their libraries with this new release courtesy of Paramount Home Entertainment. The Cloverfield Paradox is a convoluted way to give a pseudo scientific explanation for everything we have seen in the previous films as well as this film and films to come. The problem is there was no need to explain why these things were occurring and in an attempt to connect the previous films to this one and that is because no reason can compete with whatever the viewer’s imagination creates. In other words, less is more. Now looking at the events of the first two films, one could reason they both were happening on the same Earth because if you take the amount of time between the theatrical release of the first two films and where they take place, it is reasonable to assume that people in crisis during 10 Cloverfield Lane would probably not have any reason to mention the events of the first film anymore than New Yorkers discuss the destruction of the World Trade Center during the news coverage of the recent wild fires in California or the Tsunamis that hit Fukishima in 2011. It does not belittle any of these events, but if aliens attacked tomorrow, how many people would start talking about the giant monster that attack New York City? Realistically I just do not believe those things would be referenced in the context of the second film and even if you disagree with me, can anyone honestly say that the answer they got in The Cloverfield Paradox was satisfying? Another problem with The Cloverfield Paradox is it is not really a paradox in the classic sense. A paradox tends to be a mysterious occurrence that defies rationality. While there are events in the film that seem strange, they do not really add up to much and the fact that things that occur in one r laity effect all realities might sound clever, from the point of view of the characters in Cloverfield, 10 Cloverfield Lane and The Cloverfield Paradox, none of these events seem paradoxical because no one is aware of what is going on in the other realities. The Cloverfield Paradox tries to be a spooky and thought provoking sci-fi thriller, but other films like the original Alien and Event Horizon have done it much better. I would recommend anyone who wants to create a truly spooky and thought provoking feature film that should be akin to a haunted house in space should study some of classics intensely so they realize that it is not the presence of the extraordinary that is scary, but rather the atmosphere it creates regardless if the characters are aware or not. So look at Stanley Kubrick’s The Shining and the low budget haunted psychiatric hospital film Session 9. A great example of a b-movie that has a surprise ending is Planet of the Vampires. A film that is much an inspiration of sorts to Alien as it is the works H.P. Lovecraft. In fact Lovecraft was a definite inspiration in the writing of Alien and I have to believe after reading some of his stories that Lovecraft and the idea of cosmic horror has had a profound impact on all the subgenres within sci-fi, horror and fantasy as the early tales of Gilgamesh has had on mythology throughout history. 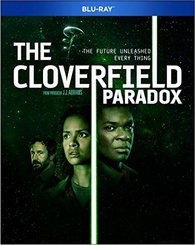 Now despite everything I have stated above, I would still recommend The Cloverfield Paradox for completists who have to own all three movies on Blu-ray Disc, curiosity seekers and film students to compare for themselves and discover why what doesn’t work in The Cloverfield Paradox worked in the others and why the first two Cloverfield movies are generally better genre films as a whole. Unconverted to 2160p, The Cloverfield Paradox looks fantastic and spotlessly clear on Blu-ray Disc with a nice widescreen aspect ratio and a very good English Dolby ATMOS Soundtrack. French, Spanish and Portuguese Dolby Digital 5.1 Soundtracks as well as an English Descriptive Audio Track are encoded onto the Blu-ray Disc along with English Subtitles for the Deaf and Hearing Impaired as well as English, French, Spanish and Portuguese Language Subtitles provided as options. Actually there are more audio tracks and subtitle track options listed on the Blu-ray menu that includes, but is not limited to Danish, German, Latin American Spanish, Italian, Japanese, Polish and Thai too. I spun this disc on both an Xbox One S and an LG 4K Blu-ray player and found that the Xbox One S featured preview trailers for Overlord, A Quiet Place and 10 Cloverfield Lane, but the LG completely skipped over these trailers for reasons I am not sure about. A making of featurette (14:24) and a short about the ensemble cast (14:49) wraps up the bonus materials and options found on this Blu-ray Disc. The Cloverfield Paradox is available now at retailers on and offline on Blu-ray Disc as well as sold separately on DVD individually or packaged with the first two films in the series now courtesy of Paramount Home Entertainment. (C) Copyright 2019 By Mark A. Rivera.